Come home to Moosewood's charm and easy going style. Relax in in the roomy and spacious living room or dining room. Gather in the country kitchen for family meals. Moosewood is the perfect home away from home. Three separate bedrooms (bedroom 1 has one queen bed; bedroom 2 has one double bed; bedroom 3 has 2 twin beds) accommodate up to six people comfortably. There's no waiting with Moosewood's two full bathrooms. You'll love Moosewood's outdoor amenities too. Relax in the hammock or porch swing. Sip a cold drink underneath the colorful umbrella. Marvel at Moab's brilliant night sky while soaking in the hot tub. Our downtown location couldn't be more convenient. Walk to town or ride your bike to Moab's famous Slickrock Trail. Restaurants and shops are just two blocks away. Additional amenities include: AC, Wi-Fi, Cable TV, laundry room with 2 washers and dryers, and a BBQ. -My pet is not aggressive; up to date with vaccinations and is well socialized with other animals and with other people. -My pet is free of ticks and fleas. -My pet will be with me under my care at all times. -My pet will be on a leash and under my control when outside. -I will clean up after my pet and dispose of any waste. -I will keep my pet off of all furniture including the bed, chairs or couches. -I will assume financial responsibility for any damage caused by my pet during my stay. Parking at 3 Dogs & a Moose is limited. No RV's or large trailers please. 3 Dogs & a Moose cottages are the inspiration of 4 good friends coming together to provide a unique lodging experience for Moab visitors. Our vision was to the design the type of accommodations in Moab that we look for when we travel to other beautiful locations. The key ingredients: style, comfort and imagination, were top priority. Committed to our ideals, Denice, Kim, Matt & Moose brought our energy, talent, and all the money we could scrape together, to 'the table' to finally realize our dream with 3 Dogs & a Moose cottages. Come and stay, enjoy and play! Unique and attractive atmosphere both inside and out. Within walking distance of restaurants, bars, shops, grocery, liquor store, museum, info center, walking trail; short ride to Slickrock Bike trail. 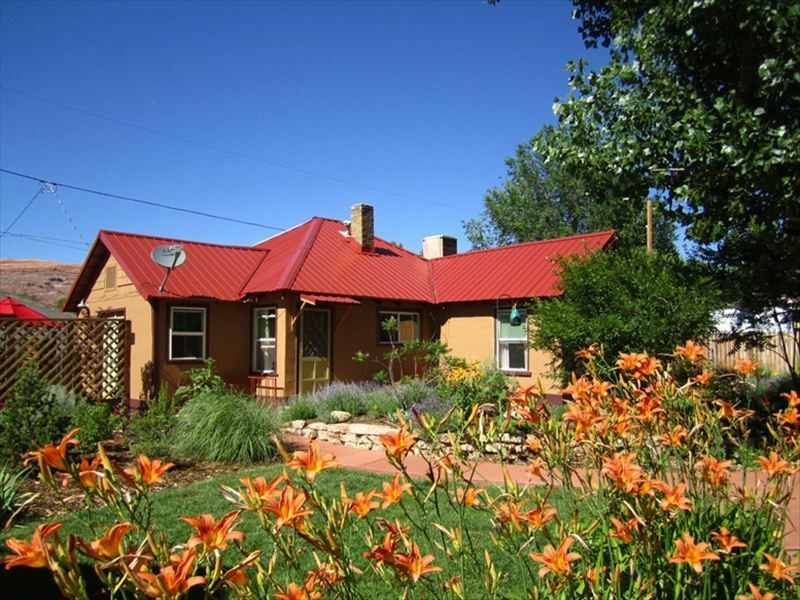 Moosewood was a perfect place for our family of 4 to spend a few days in Moab. It was in a perfect location to walk into town for a cup of coffee or dinner, or to explore the shops. The home was nicely decorated, well equipped for cooking, and very clean inside. The outside garden setting was perfect to relax in a hammock or to enjoy morning coffee. I certainly hope to come back and stay someday! Such a nice little cottage! Very convenient location and the garden was lovely! Had a blast staying at Annie’s home in Moab. Took my two little ones and my older parents. We fit comfortably. Close to town. Would stay again. My family of 5 with dogs very much enjoyed our visit to Moab and our stay at Moosewood. The home is comfortable with all the ammenties we needed. The location is super convenient for outings to parks/hikes as well as walking into town for shopping and dining. The bedding is comfortable as well. We’d definitely return to Moosewood and Moab! Our family really enjoyed this property and its amenities. Annie was fantastic and very attentive to any of our questions or needs. Highly recommend this property and if we are back in Moab anytime soon we will book this one again. Thank you Bill! It was so lovely to be able to meet you and your family during your stay with us. I am so glad to hear you enjoyed your time with us - please know you are welcome back anytime! Pet Policy: We allow one dog in Moosewood. Our pet fee is $10/night/pet, and we will leave an envelope in your cottage for the fee. In your cottage you will find a "Pet Package" containing a towel, waste bags and yummy treats to welcome our four legged guests. To ensure that all guests have an enjoyable stay, we ask pet parents to agree to the following Pet Policy before booking one of our pet friendly cottages: I have read and agreed to the following Pet Policy for cottages at 3 Dogs & a Moose and I promise that: -My pet is not aggressive; up to date with vaccinations and is well socialized with other animals and with other people. -My pet is free of ticks and fleas. -My pet will be with me under my care at all times. -My pet will be on a leash and under my control when outside. -I will clean up after my pet and dispose of any waste. -I will keep my pet off of all furniture including the bed, chairs or couches. -I will assume financial responsibility for any damage caused by my pet during my stay.